I am using fmDNS 2.0.1 and trying add a server clause (for TSIG) but not able to find it. I was able to add the key and allow-transfer option but not seeing the server clause. Could this be added to fmDNS? The server clause isn't fully supported (yet), but you should be able to use the key feature. Once you define the key, go to Config->Servers, click the edit button for the server you want, and in the box you can select the key. Let me know if this doesn't achieve what you're looking for. Hey thank you for your reply. I have the keys feature working and it should get be by for now. Just wondering when server clauses will be fully supported in fmDNS? Good question and unfortunately there isn't a target date let alone target version yet. Still lots to do. I'll leave this issue open to track the feature. It would be great to have this feature. We need to make fmDNS's managed servers transfer a zone from other's name server using TSIG, and we are still unable to do it. We are running fmDNS 3.1.2. Thanks! I've been stuck on this feature for quite some time because of the design and intention of the Config->Servers page. That was intended to configure the fmDNS servers so the clause has very limited support. To change that, it might be best to remove the key select from the server and create a new page for "remote" servers where the full servers clause would be supported. Would that make sense or be the best approach to implement this feature? Another idea is to support fmDNS servers and remote servers all within the same page. The configuration window would just be different based on a drop-down selection for "local" and "remote" servers. The configuration window would, of course, include the supported server clause options. This might be a better way to go for ease-of-use. From a logic perspective, since the BIND server configuration statement can contains host-specific data (i.e. the query-source option), it would be better to include it in the Config -> Servers page, even if I guess that a dedicated page for "remote servers" would be easier to use. This is now implemented in fmDNS 3.3 and later. Wonderful! 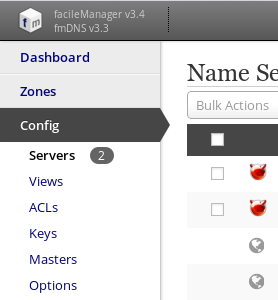 Thank you so much for this work: we upgraded to the latest release, defined a few "remote" servers and set for them TSIG keys... zone transfers from those server to the ones managed with fmDNS are now authenticated! Just a question about the the count of remote servers that we noticed in the left menu, as if there where some change to commit (see attached screenshot): it's a normal behavior, or we misconfigured something? Thanks for the report @andrewhotlab - the menu badge counts issue you are experiencing is found to be a bug that was introduced with this feature. It will be fixed in fmDNS v3.3.2.